Purchasing inventory shouldn't be a full-time job for store owners. No matter how many sales channels you sell through, or how many distributors you purchase from, we make creating and sending out purchase orders a snap. If you have purchase order drafts printed out, reopening them for editing and submission is a piece of cake. 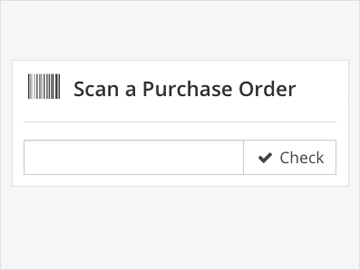 Simply scan the barcode in the corner of the purchase order to open it on SKULabs. From there, you can make changes or send the order to your supplier. 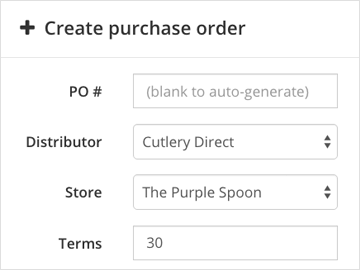 When orders are placed for items you don't keep in stock, you can quickly create and submit purchase orders based on the orders' contents. 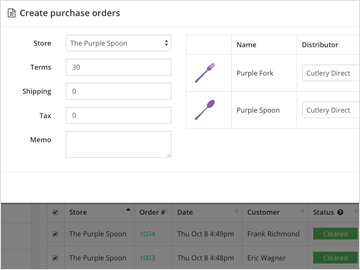 Simply select the orders you want to build your purchase orders from, and SKULabs will automatically add the right quantities to the right POs with the right distributors.